Image by Alain de Maximy courtesy of iStockPhoto. It’s a bitter irony that, for those in the global health community contending with viral outbreaks, many of the barriers to mounting an effective response are man-made. Geopolitical and cultural divides that separate us as people can inhibit research efforts and humanitarian aid. Viruses, meanwhile, pay little heed to such arbitrary boundaries; they prey instead on what we all have in common — our shared, human biology. In scientific research, man-made barriers range from the personal (professional expediency and a legacy of siloing and secrecy in science) to the practical (the bureaucracy and logistics related to patient data privacy, biological sample collection, and storage). All of these factors came into play as the Ebola outbreak erupted last year in West Africa, threatening to delay both scientific discovery and delivery of medical care. But with colleagues in harm’s way and in the face of a growing public health threat, researchers in Broad Institute Member Pardis Sabeti’s lab were determined to overcome such obstacles. Already on the ground studying Lassa fever in Sierra Leone’s Kenema Government Hospital, in collaboration with Tulane University, the group was positioned to analyze the first blood samples when suspected cases of Ebola appeared in the country. The team used genome sequencing to confirm that the virus was present in the samples, then began the work of using that data to trace the strain’s roots and monitor its evolution. At every step — as more and more samples came their way for sequencing — Sabeti’s group made their Ebola data available to the broader research community online. The availability of the data attracted the likes of phylogeneticists Andrew Rambaut in the UK, Trevor Bedford in the US, and Eddie Holmes in Australia whose teams immediately set to work analyzing the data, adding to the manpower dedicated to tracking the virus’s development. Such open sharing of research data is not the norm within the scientific community; researchers who have invested their time and resources in generating and studying their data typically do not share it until after they have published their findings. But in context of an outbreak, where lives hang in the balance, the need to share information and engage with the broader scientific community, in Sabeti’s view, held the greater benefit. Nearly a year later, the team’s approach to data sharing has paid off. They’ve forged connections with like-minded researchers worldwide, earned the trust of others who may have been skeptical of the efficacy of the open access model, and benefited from an expanding network of collaborators that now includes government agencies and researchers from academia and industry. The paper concludes with a section that suggests promising leads — signals and mutations within the viral genome — for the scientific community to pursue. Both the main findings and the supplemental analyses would not have been nearly as robust were it not for the scientific collaborations forged during the outbreak. Roughly two-thirds of the samples were collected by Sabeti’s group, but a crucial remaining third were supplied by CDC. Those samples were deliberately selected to complement the Broad’s collection; the Broad had stopped receiving Ebola samples from Kenema as the virus died out in the region, but the CDC laboratory in the Southern Province city of Bo continued to receive samples from throughout Sierra Leone. They had samples that were both geographically diverse and spanned a greater time frame than those collected by the Broad alone. CDC and the Sabeti lab also found other advantages in working together, including the division of labor, sharing of resources, the opportunity to learn new techniques, and the exchange of complementary knowledge of virology and bioinformatics. Most importantly, the collaboration leveraged the expertise of the two groups: Sabeti’s team had methods and technologies that enabled them to sequence a large number of samples in great depth, while CDC was able to provide what Daniel Park, a Broad researcher and the paper’s co-first author, described as “some of the cleanest, easiest samples to sequence” his team had ever studied. While Sabeti’s team had struggled to keep their samples from degrading at the height of the outbreak, during which travel restrictions and shifting priorities left the samples sitting in wait for weeks or months at a time, CDC had a collection and processing method that had been honed by their Viral Special Pathogens Branch over many years responding to Ebola outbreaks in Africa. The Broad research team also found strong analytical partners in members of USAMRIID’s Center for Genome Sciences (CGS), who were onsite at the Liberian Institute for Biomedical Research in Margibi, Liberia in November 2014 to help fight the outbreak. 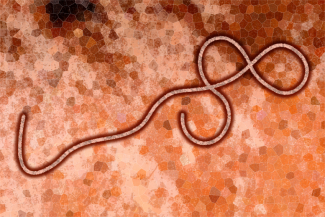 The USAMRIID team was able to extend computational analyses that they had been using to track Ebola to the powerful dataset provided by the Broad and CDC. Their analyses were not only central to the main findings of the Cell paper, but also informed the leads presented in the supplement. And, again, the research of the respective teams benefited from collaboration. Among the questions addressed by the Cell paper that have the potential to shape policy was whether “porous borders” contributed to the rampant spread of the disease. (The data suggested that they likely did not — that Ebola spread mostly within borders after its initial introduction.) The analysis of mutation patterns within the evolving Ebola strain also has public policy implications, as mutations in certain regions of the genome could interfere with potential treatments. These matters of public health policy were also of particular interest to the government agencies involved in the research. “Our main goal, as the premier genomics laboratory of the Department of Defense, was to advise policymakers, the medical community, and those involved in the development of pharmaceuticals on the effects viral evolution might have on medical countermeasures as a consequence of the sustained human-to-human transmission during the Ebola outbreak in western Africa,” Palacios said. Working with the larger international team enabled them to formulate analyses based on a strong dataset built by an expansive group of collaborators. In addition to public policy, Sabeti hopes that the team’s successful collaboration will inform policy in the realm of scientific research. In February of this year, Sabeti and two scientists in her lab, Nathan Yozwiak and Stephen Schaffner, published a much-talked-about commentary in the journal Nature calling on the research community to establish principles and protocols for rapid and responsible data sharing during epidemics. *For more in-depth detail about the scientific findings of the paper, read this press release from Harvard University.